On November 28, 1864, 150 years ago today, the 13th Pennsylvania Cavalry went on a scout past Lee’s Mill, onto the Jerusalem Plank Road, and down to near Stony Creek Station on Rowanty Creek. Regular readers will recall that a detachment of 50 troopers from this same Pennsylvania regiment had scouted in the same direction on November 16, 1864, eventually fighting a skirmish just east of the Jerusalem Plank Road about two miles south of Lee’s Mill. This time, the full regiment would go, and they would move far beyond the original scout. So Gregg’s mission was clear: send a regiment down the same road past Lee’s Mill which the 13th Pennsylvania Cavalry had scouted earlier in the month. Only this time, the goal was much further southwest. He again went to the 13th Pennsylvania, this time sending the entire regiment rather than a detachment. The larger number of men was befitting of the larger mission. Colonel Michael Kerwin had his men saddled and ready to move out at dawn, but the engineer officer promised by Meade’s headquarters did not arrive for hours, finally allowing the column to move at 8 a. m. They again headed south down the road to Lee’s Mill, but this time found the bridge across Warwick Swamp to be missing planks. After repairing this minor inconvenience, the column proceeded south to the Proctor House, which was located on the Jerusalem Plank Road. It was here that the Pennsylvania troopers encountered a Confederate vidette. After brushing them aside, a squadron was detailed to stay and hold the Jerusalem Plank Road while the rest of the regiment continued south. Kerwin and his men moved south on the Jerusalem Plank Road to where it intersected the Stony Creek Road. Making a right, they proceeded for a while before encountering another Rebel vidette at the Dunn House. This small force proved only a minor nuisance, and they were brushed aside in a similar fashion to those Rebels stationed at the Proctor House earlier in the day. Colonel Kerwin commented in his report that this force’s reserve appeared to be off to the north in the direction of Salem Church. Continuing on, the 13th Pennsylvania Cavalry eventually neared Rowanty Creek, and this would be as far as they could penetrate on this expedition. What appeared to be the main Confederate Reserve was stationed here. Kerwin, having done as he was asked, returned in the same direction he had come. The small expedition was a success. The Northern cavalry had bagged “2 prisoners, 13 contrabands, 22 mules, 5 horses, 6 wagons loaded with wheat, &c., and 2 carts.” In addition, the Federals had learned that the force positioned two miles south of Rowanty Creek at Stony Creek Station was a moderate one, consisting of Hampton’s dismounted men who no longer had a horse to ride and two cannon. 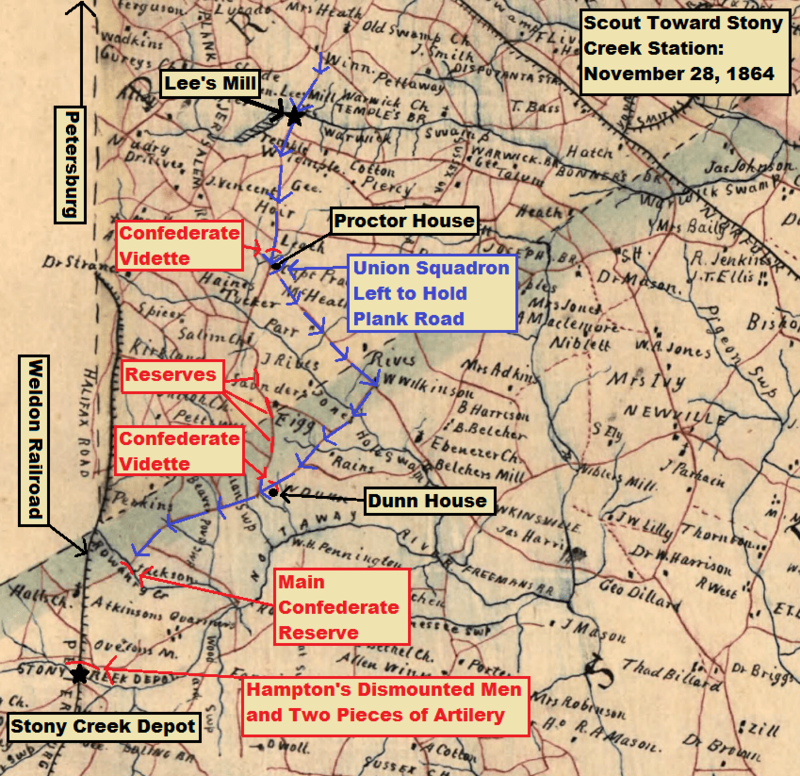 In addition, the main body of the Confederate cavalry appeared to be stationed at Dinwiddie Court House, well to the west. Grant and Meade welcomed this news, and it would prove useful in early December.